With 72 games remaining in the Premier League this season before the matches on Saturday and Sunday, an average of three goals per game would see a record level of scoring this campaign, the 19th season in the League’s history. Overall so far this season the rate works out at 2.77 goals per game, which if maintained season-long would reap a harvest of 1,052 goals – the third-best season, and only one goal behind the total for last season. 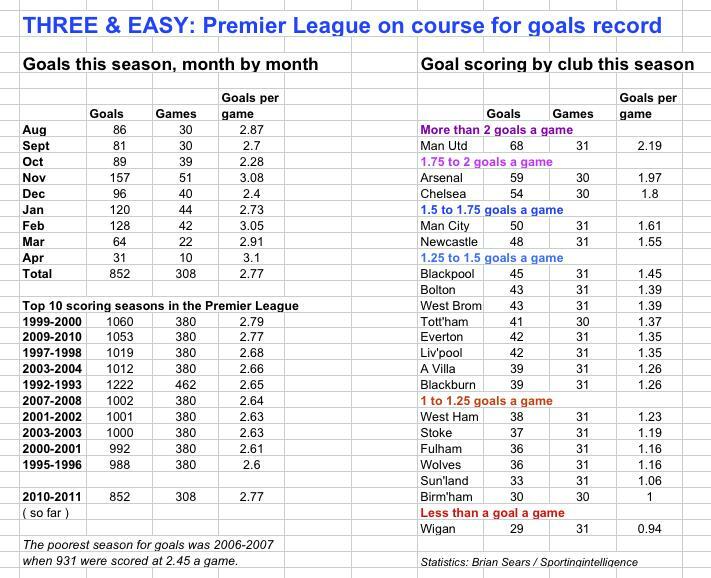 But since January, goal-scoring has actually touched three goals per game, and that rate maintained would be enough to better the record of 1,060 goals of 11 seasons ago. Last season it was Chelsea who gave a late boost to the season’s tally with 38 goals from their last 10 games – who could follow in their shooting boots this campaign? As things stand, Manchester United, with 2.19 goals per game, Arsenal (1.97), Chelsea (1.8) and Manchester City (1.61) are leading the way in scoring. If all clubs were so prolific, we’d be looking at rates of four goals per game or thereabouts! At the other end, Wigan have scored fewer goals than anyone at a rate of 0.94 per game, while Birmingham have precisely a goal per game, and Sunderland, Wolves, Fulham, Stoke and West Ham haven’t exactly been keeping the net-fixers busy. See the table below for rates per team so far, and goals per month in the Premier League this season, as well the best 10 seasons of scoring to date in the revamped top flight since 1992-93. In the run-up to last weekend’s matches, we took a statistical stab at predicting the final table based on historical results between sides still to play each other. Those articles predicted the title winners, and the clubs to be relegated, and the main piece also stressed the numerous reasons why such predictions are likely to be knocked by reality. Indeed a third piece on West Brom and Stoke trying to break ducks against Liverpool and Chelsea proved prescient when the Baggies won and Stoke drew. In the interests of keeping tabs on ourselves, it should be stated that using stats history only produced four of 10 correct outcomes last weekend: Everton’s draw with Villa, United’s win at West Ham, plus home wins for Fulham and Manchester City (the latter forecast in this ‘easy pickings’ piece). History – and most neutrals, in all probability – would not have expected Blackburn to take a point at Arsenal. History suggested Bolton could draw at Birmingham, and that Wolves could draw at Newcastle (all previous Premier League meetings had been 1-1). Liverpool and Chelsea were both expected to win, as were Tottenham at Wigan. But there you go: that’s the unpredictability of the Premier League for you! Yet if we again applied the same historical forecasting to the updated table, we reckon Manchester United will still be champions, by six points from Chelsea, with Arsenal third, with Manchester City (now) fourth, a point ahead of Liverpool and Tottenham. West Brom and Wigan would finish on 38 and 37 points respectively and Aston Villa would now be relegated on 41 points.